This set of photos was taken on December 19, 2012 at 2:48 PM. The location was in front of my house in Bethesda, Maryland. The "Take It!" 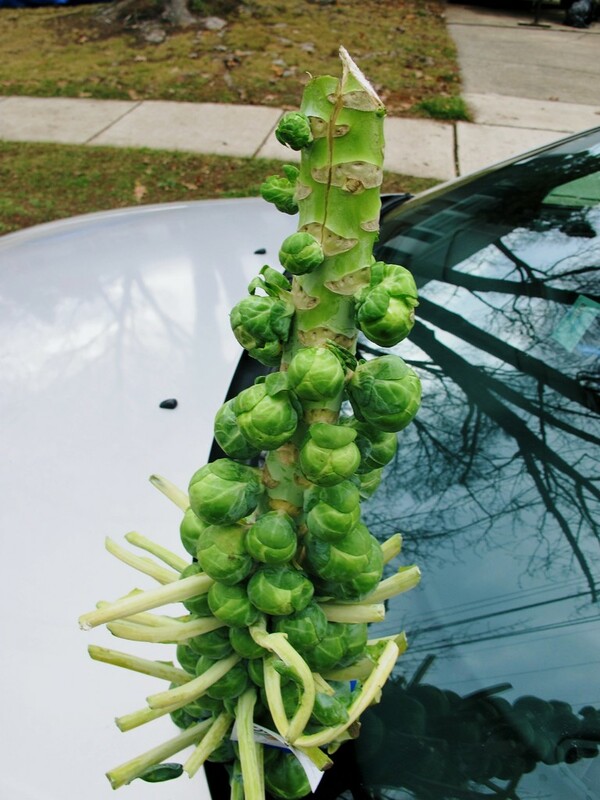 came from my having been surprised by seeing brussels sprouts on the stalk, being sold in the local grocery store which I frequent. It was the first time I had ever seen them in a grocery store being presented in this manner. 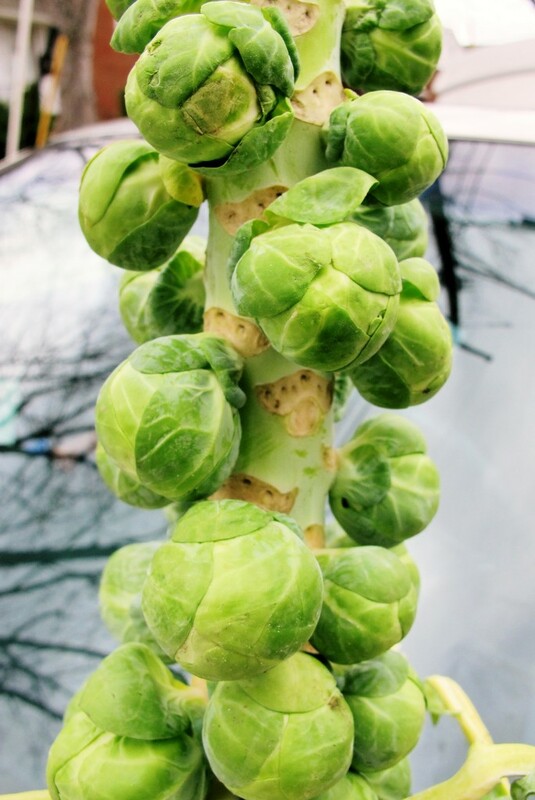 I had seen tomatoes and grapes being sold on the vine, but never brussels sprouts on the stalk. I had only seen them growing in a field once in my life - and that was a long time ago. 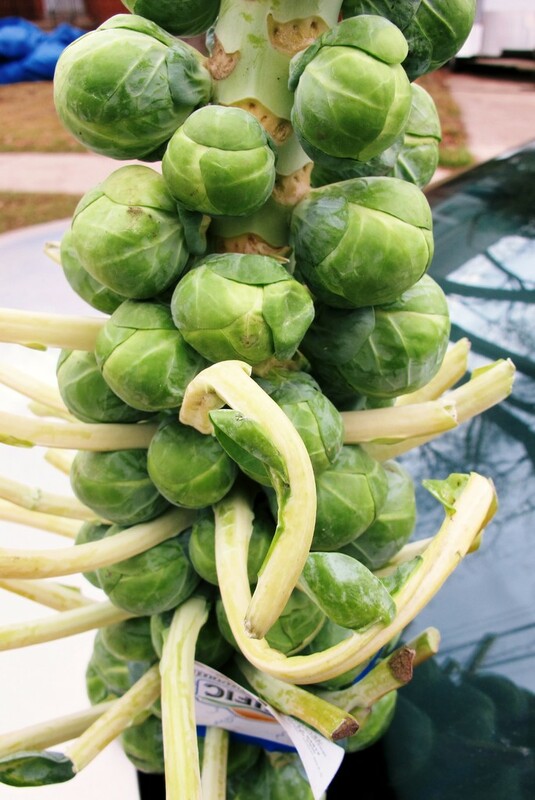 As chance would have it, I had an appointment with one of my attorneys and the growth appearance of brussels sprouts was used by me as a comparative example. The man looked at me - like I had just made some sort of other worldly reference. It was immediately obvious he had no idea of what they looked like before being picked and packaged to be viewed in the frozen section, and occasionally loose when sold freshly picked. Strangely a few days after this appointment I found them, on the stalk in the grocery store. I bought the stalk and took these photos. By the way, all of the photos were taken of the stalk being upside down. Those curly things coming out of the clusters are the ends of the trimmed off green foliage that is at the top of the plant when it is in the field growing. I have to confess, I did not figure this out until I sat down to write up this explanation. I made the photo shoot in front of my house using the gap between the windshield and the hood of my car to hold the stalk up for the pictures. Again - they are all upside down. The plant is ever so strange in appearance on its own. 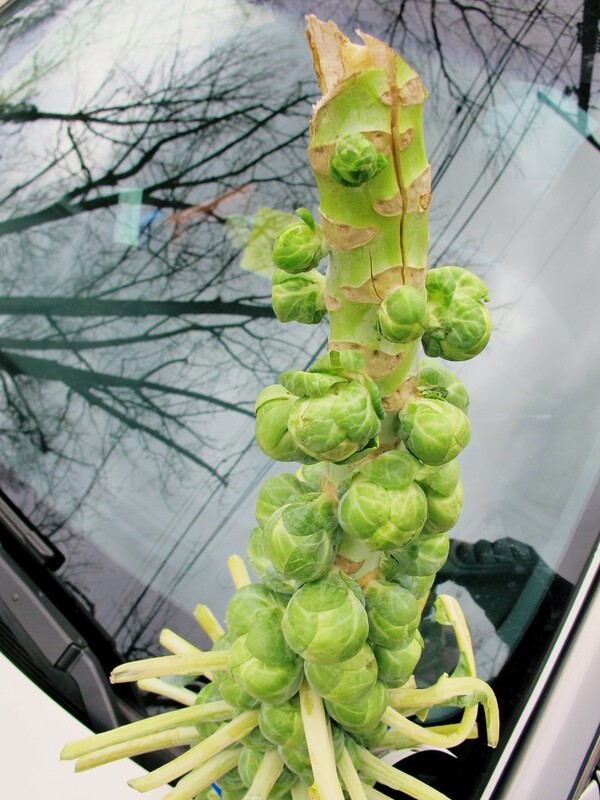 When placed this way on the car - it made them even more strange with the reflection in the windshield of the bare tree branches overhead. After the photo shoot, I took the stalk to my attorney and gave it to him. My visit was unexpected and I am certain he was quite into something else. Needless to say, he was quite amazed at this odd display of nature and without question, immediately took in what I was referring to in our earlier conversation. I did not take a lot of his time, but left with him shaking his head in the shared wonder of it all. The After Take: This is a double after take. There is the take, as spoken of above, and also the reaction of those to whom I showed the photos. I found one person who had seen them occasionally sold like this in their grocery store. Everyone else was captivated in hearing the story of how they grew. I also found out that not many people like to eat them. They taste like cabbage and look like cabbage, but could not be further away from the look of regular cabbage in how they grow. I had a lot of fun with all of this. I hope you may have gotten a kick out of all of the little twists and turns this set of photos took on their way to being shared. Here is hoping you also have some joyful twists and turns as you go about your busy days.